This example program shows how to program the V5 Clawbot to use data from the Vision Sensor using Modkit. The program has the robot move forward when it detects a green object, turn right when it detects a yellow object, turn left when it detects a red object, or stop when it does not detect an object. This program uses a loop to check the Vision Sensor data for Signatures 1 through 3, repeatedly. If one of those signatures is detected, it broadcasts that there is an object of that color detected. That broadcast then triggers a series of commands that change the display on the brain and have the robot move forward, turn left or right, or stop (no signature detected). Then, the program enters into a forever loop and the Vision Sensor takes its first snapshot of Signature 1 (SIG_1 = green). Then, the program decides (Boolean: 1-true / 0-false) if the Vision Sensor detects that the largest green object exists and that the largest object's width is greater than 5 . If that is true (1), it broadcasts GreenObject. If those two conditionals are not both true (0-false ---> else), the Vision Sensor takes a snapshot of Signature 2 (SIG_2 = yellow). 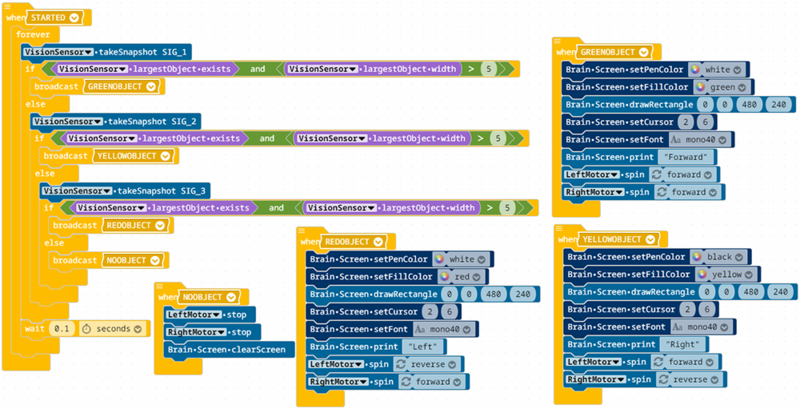 Then, the program decides (Boolean: 1-true / 0-false) if the Vision Sensor detects that the largest yellow object exists and that the largest object's width is greater than 5 . If that is true (1), it broadcasts YellowObject. If those two conditionals are not both true (0-false ---> else), the Vision Sensor takes a snapshot of Signature 3 (SIG_3 = red). Then, the program decides (Boolean: 1-true / 0-false) if the Vision Sensor detects that the largest red object exists and that the largest object's width is greater than 5 . If that is true (1), it broadcasts RedObject. If those two conditionals are not both true (0-false ---> else), the program broadcasts NoObject. Then the program waits 0.1 seconds and starts the loop again by taking a Snapshot of Signature 1 and continuing.